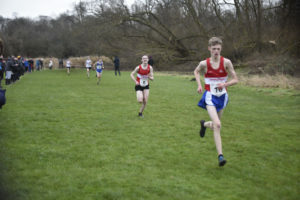 Fresh from their victory at the Scottish 6 stage relay championship Cambuslang Harriers travelled to Sutton Coldfield to participate in the British Athletics 12 stage relay championship. This is very much the blue riband event for British Athletics Road Running clubs consisting of 12 stages (alternating 6 long and 6 shorter legs) covering over 51 miles of racing and requiring real strength in depth and commitment from the participating clubs. Cambuslang were accompanied by their Edinburgh rivals Corstorphine who had won the Scottish 6 stage in 2018. 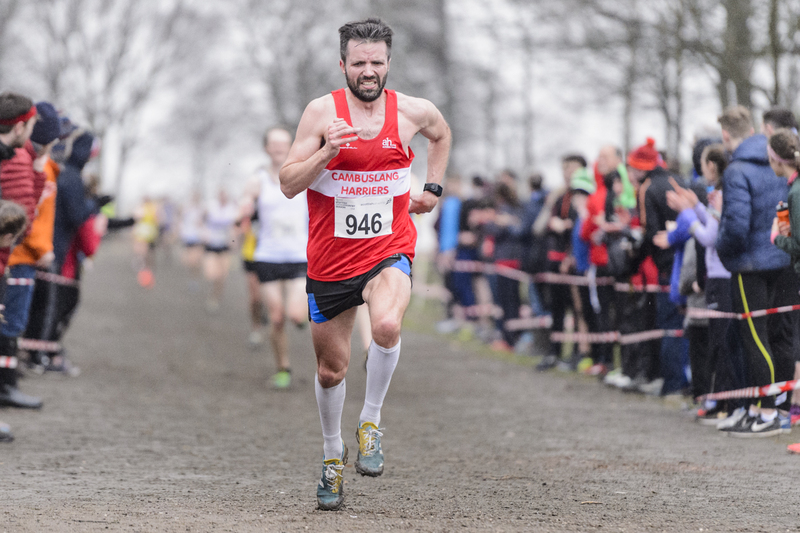 Kevin Harvey started the race for Cambuslang and found himself in a really competitive and fast opening leg against several of Britain’s best road runners. He successfully kept the club in contention close to the leading teams. He was followed by 18 year old Drew Pollock who recorded the club’s fastest short leg of the day. Between them they had achieved a solid 23rd place, importantly just over a minute behind eventual winners Leeds. 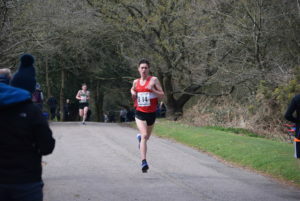 Next to take on the long leg was 20 year old Gavin Smith. He produced another solid and steady performance which was becoming the theme of the day. Richie Carr then had a strong short leg that moved the team up a few places in the race so that after 4 stages they were 20th. 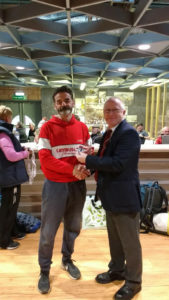 Two of the club’s more experienced runners Stuart Gibson and Alistair Campbell were next with Stuart producing the club’s fastest long leg time before passing on to Ali who completed the leg with his trademark sprint finish. After their legs the club had moved up to 17th. The second half of the race again saw a number of Britain’s best endurance athletes toe the line and leg 7 featured several GB Internationals. 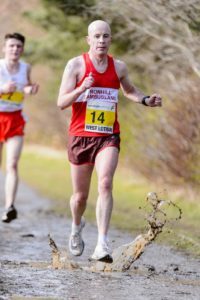 Cambuslang’s hill running specialist, Alasdair Campbell was tasked with this leg and acquitted himself well. Although he was passed on his leg by a couple of teams he closed the gap on several clubs whom we were now targeting. Jamie MacKinnon was next into the fray and after another solid run the team was 19th. Over the last 4 legs the strength in depth and balanced nature of the Cambuslang team bore fruit and they steadily moved up the field. 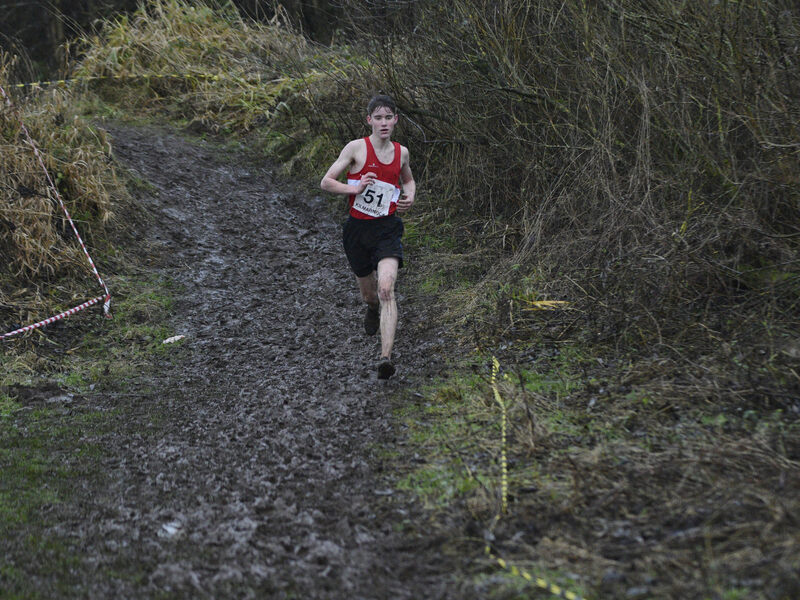 Ryan Thomson on leg 9 eased the team into 17th place which Ben Hukins preserved. This was Ben’s 4th consecutive race but his first on a short leg. 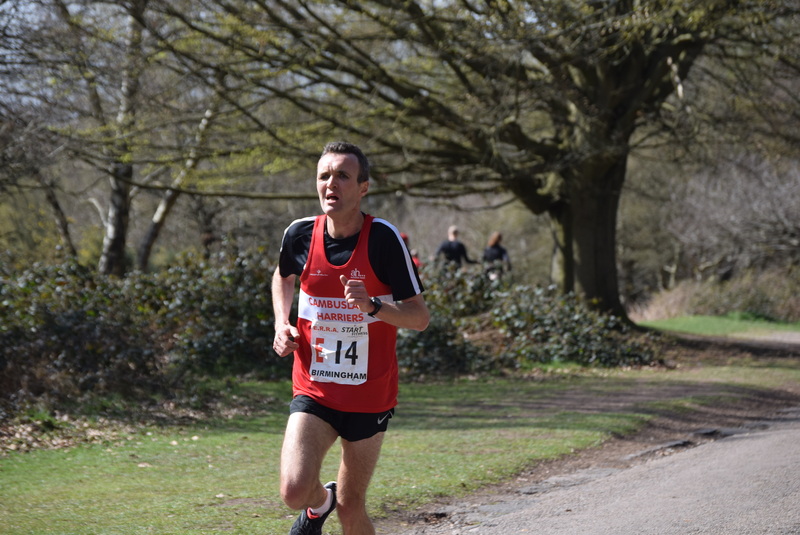 Club captain Iain Reid in final preparation stages for the London Marathon promoted the team to 16th before another ever present Craig Jardine secured an excellent 15th place ahead of several more fancied English clubs and 4 places ahead of Scottish rivals Corstorphine. Overall this was a well balanced team effort by the club with only 68 seconds of a difference between all 6 long stage runners and a mere 27 seconds between the 6 short stage runners. This level of consistency helped to produce the club’s highest finish ever in this prestigious UK event and took 5 minutes and 45 seconds off the club record. Events such as this are important in fostering team spirit and in providing athletes with the opportunity to compete at a high level. 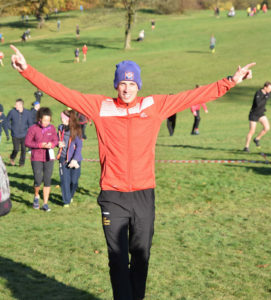 Brendan Carey, the travelling reserve, who made himself available throughout the race in case of any problems, deserves a special mention as does the back-up support crew of Mike Johnston and Charlie Thomson. Fiona Pollock also made the long journey to Birmingham to support her son Drew and was accompanied by her mum and dad, Sheila and Robert Anderson, who had just returned from Australia the previous day. 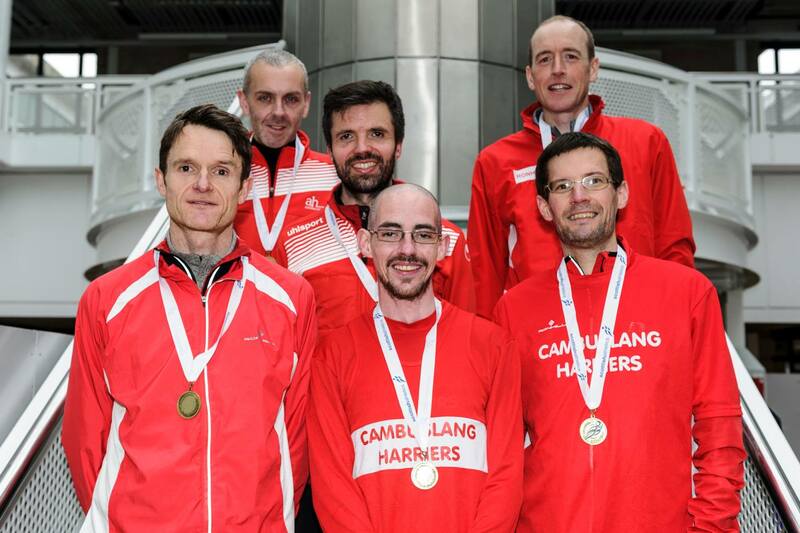 Cambuslang Harriers brought the winter season to a spectacular conclusion by winning team gold in both the Junior/Senior Scottish 6 Stage Road Relay Championship and in the Masters over 40 Men event with the over 50 male quartet lifting team bronze. The club again underlined its consistent performance over the years in these 3 age groups having won 6 senior gold, 8 silver and 11 bronze medals while the M40 team has amassed 8 gold, 3 silver and 1 bronze and the M50s 5 gold, 1 silver and 1 bronze in the 7 year existence of this age category. 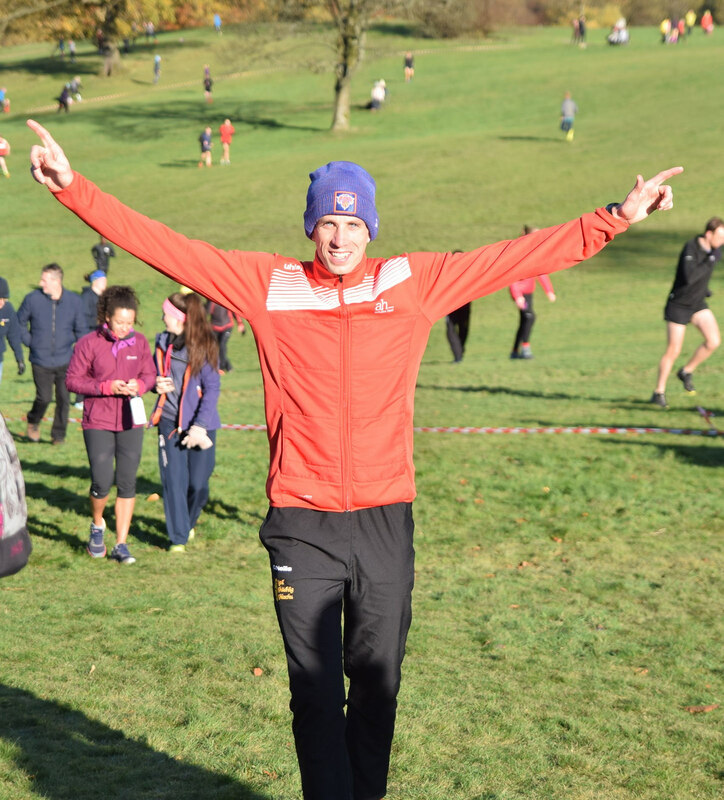 There was further icing on the cake when on the same day Kerry-Liam Wilson on his 30K road debut secured the Scottish senior and masters titles at Perth. The senior and masters men 6 stage events consisted of alternate 5K and 5.8 mile laps with only 4 stages for the Men 50 and ladies. Apart from the undulating and twisting terrain at Almondvale Livingston the runners also had to contend with 40 MPH winds. 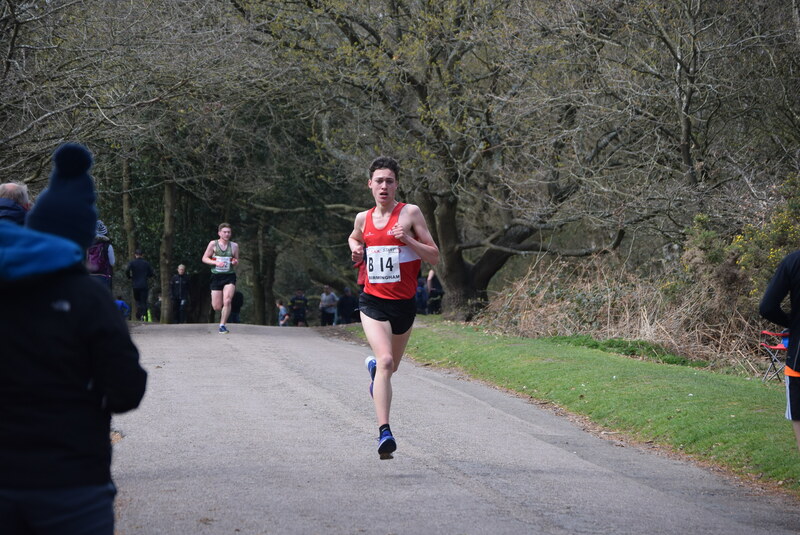 The junior/senior A team got off to an excellent start with under 20 athlete Drew Pollock having his best run of the season to hand over to Kevan Harvey in 3rd place. Kevan ran his customary gritty race to finish a close 4th. Stuart Gibson then clocked the fastest short stage on leg 3 to catapult Cambuslang into a 31 seconds lead over Shettleston Harriers. An isolated Ryan Thomson with the 2nd fastest long stage of this lap extended the club’s lead over Shettleston to 1 minute 29 seconds. Going into the penultimate stage there was some concern in the Cambuslang camp as to how under 20 Gavin Smith would perform given he had been feeling unwell prior to the race. 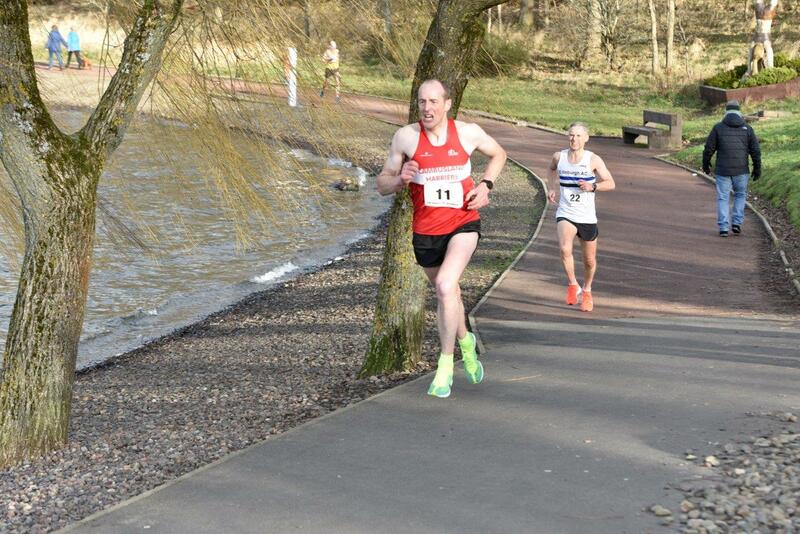 However, Gavin dispelled any such concerns by producing a gutsy 2nd fastest time for his leg to give the Lanarkshire club a seemingly commanding lead over Shettleston of 1 minute and 51 seconds. It was shaping up to be an exciting finale. 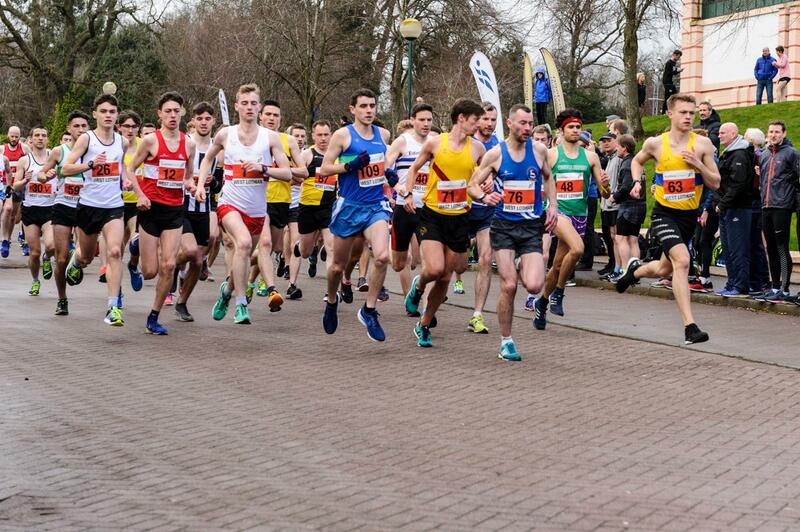 Could Fraser Stewart hang onto Cambuslang’s lead with 3 of Scotland’s finest distance runners in his wake – Lachlan Oates of Shettleston, Andy Douglas of Inverclyde only 3 seconds adrift of him and Corstorphine’s Calum McKenzie a further 14 seconds behind? 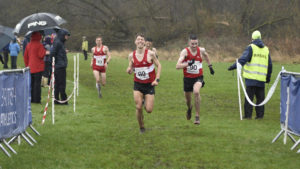 The danger was that while Fraser was running isolated the chasing trio had the benefit of racing each other for podium places which would help to reduce the deficit. 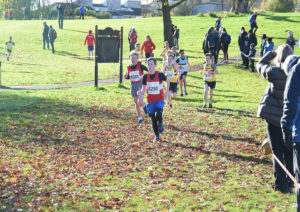 However, Fraser held his nerve and ran his own race to cross the line first with 72 seconds to spare over Inverclyde with Corstorphine a close 3rd only 2 seconds behind and Shettleston just missing out on the medals by 6 seconds. Naturally the Cambuslang sextet and supporters were jubilant having witnessed a great team effort by all. 5 of the 6 had competed well in the fast Armagh 5K road race event in mid February and this gave them the confidence to draw on. 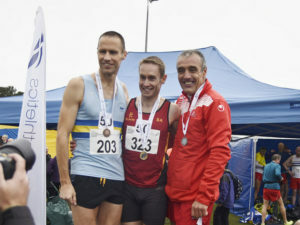 The M40 relay was also a competitive 4 way tussle between Cambuslang, Edinburgh, Corstorphine and Shettleston Harriers. On the opening leg John Paul Murphy did his job well to put club captain Iain Reid in a good position to chase the 3 rival clubs. Iain’s 2nd fastest masters long stage time of the day provided an inspired Michael Healy with the opportunity to give Cambuslang a narrow lead over Edinburgh, Corstorphine and Shettleston. The positions remained the same over the second half of the race with the experienced Kenny Campbell, Justin Carter and Ben Hukins all running strongly to post a 33 seconds victory over Edinburgh with Corstorphine taking the bronze medal. All were delighted to retain the trophy with Justin being the only survivor from last year’s winning team. John Paul and Michael were rewarded for their efforts with their first ever Scottish medals. Cambuslang Harriers also had the satisfaction of finishing the first B team which underlines their strength in depth. Ryan Donnelly, Jamie MacKinnon, Douglas Roberts, Colin Reilly, Ritchie Carr and Iain McDonald combined well to take 11th spot. The C team gained 43rd place thanks to Brendan Carey, Tony McCutcheon, Scott Hunter, Dan O’Connell, Frank Hurley and Kenny Finlayson. 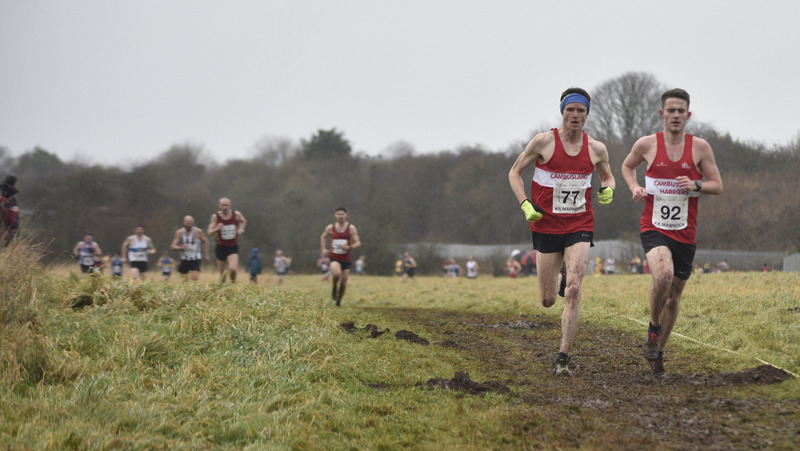 While the M50 men started off with the younger age groups there were only 4 legs for them. Cumbernauld and Shettleston finished well clear in first and second position with the Cambuslang quartet of Des Dickson, Dave Thom, Mick O’Hagan and Stan MacKenzie equally comfortable in securing the bronze medals. The female teams composed of 4 runners ran the same course and distances as the men albeit their race started 10 minutes later. Bernie O’Neil, Jennifer Reid, Lesley McArdle and Carole Setchell all worked well to record 21st position. The honours in this race went to Central AC, Shettleston and Edinburgh University. 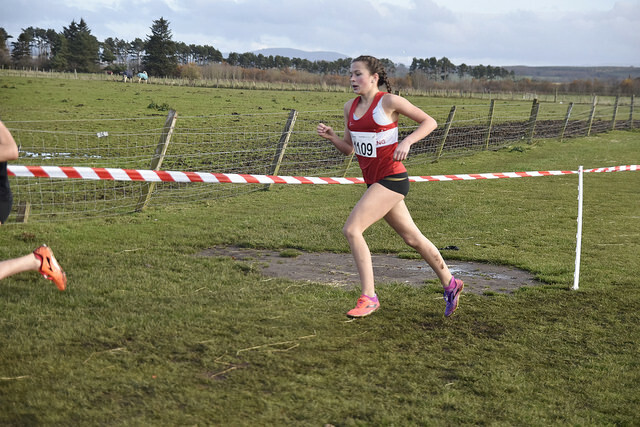 The Cambuslang young athletes had competed the previous week in the Scottish Road Races. 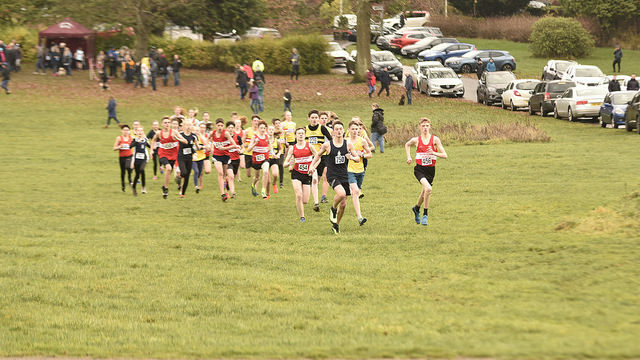 The under 15 boys team of Robbie Woods, Lewis Roddis and Zak Povey took the bronze medals while the under 17 male trio of Chris McLew, Aaron Grew and Michael Black had to settle for 4th spot. The under 15 girls finished a creditable 5th thanks to debutant Fiona Hay, Shona Carey and Eilidh Kennedy. Under 13 Abbie McClue led Mia Carmichael and Lucy McGrandle to 8th place while their male counterparts finished 14th team courtesy of Brodie McDonald, Gavin Kelly and Jay Gallacher. Under 17 runner Susie McLaughlin finished 17th in her age group. 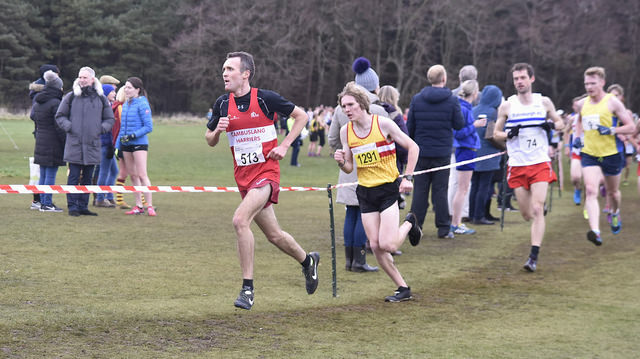 Cambuslang Harriers had yet again a very successful Scottish Cross Country Championships. 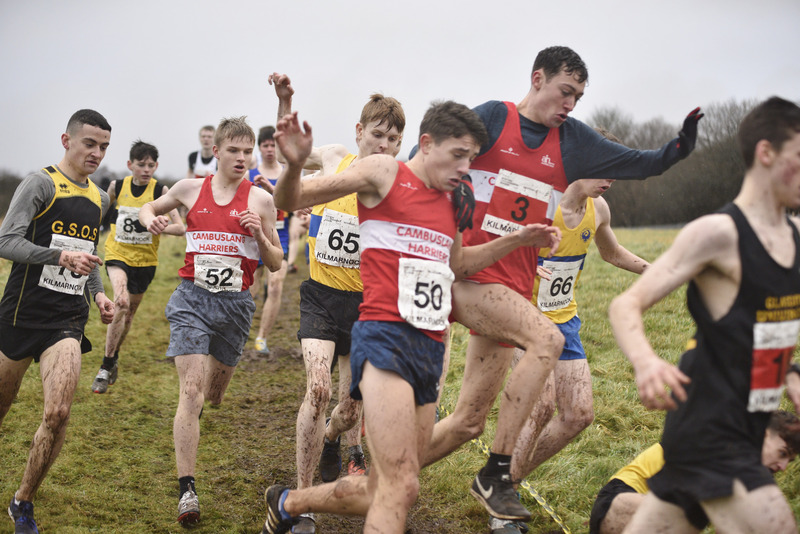 Team silver medals in the under 15 boys, under 20 men and senior men races with bronze medals for the under 17 males saw the harriers regain the AT Mays Trophy which is awarded to the male club with the best overall scoring over the 5 events. Cambuslang has won this prestigious trophy 7 times in the last 8 years and indeed on 23 out of a possible 31 occasions. This speaks volumes for the club runners, coaches, officials, parents and supporters. The ladies also played their part with Moira Stewart finishing a good 2nd to UK, Commonwealth and Olympic Internationalist Steph Twell in the senior ladies event with under 13 girl Abbie McClue achieving 10th place and first West of Scotland athlete and the under 15 girls and under 17 women gaining 5th and 6th spot in their team competitions. The U13 girls kicked off the championships with the quartet of Abbie, Eva Ritchie, Lucy McGrandle and Francesca Fairweather finishing 15th team. Their U13 male counterparts of Sam McCarthy, Brodie McDonald, Reece Duncan and Hamish Gardner were placed 16th team. Chris Black and Jay Gallacher provided backup. The under 15 girls thanks to Shona Carey, Niamh Riggins, Peggy-Nan Rodgers and Eilidh Kennedy were a creditable 5th. Good team packing by Robbie Woods, Lewis Roddis, Joa Fairweather and Zak Povey gave the quartet a silver podium placing. Fearghus MacGregor and Mark Cassidy were also well placed. Susie McLaughlin in 16th spot acquitted herself well in the ladies under 17 event to lead Holly Brock and Rachel Wardrobe to 6th place. 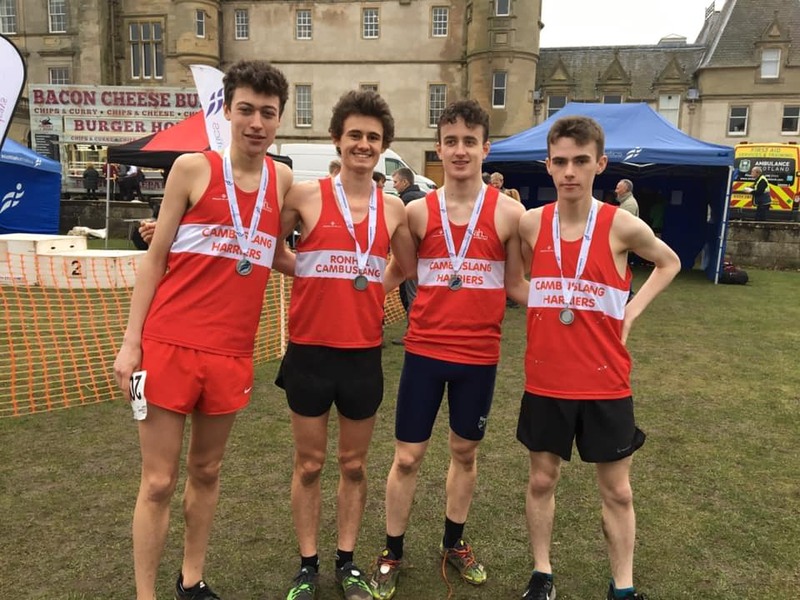 In spite of losing the injured under 17 Ruairidh MacGregor his team mates Chris McLew, Aaron Grew, Michael Black and Brodie Aitken rallied to take the bronze medals in their age group with Kai Newell, Jack MacKinnon and Keir Crawford finishing next. Cambuslang continued their medal winning streak when 7th placed under 20 Gavin Smith led Drew Pollock, Ryan Donnelly and Struan Paton to team silver. 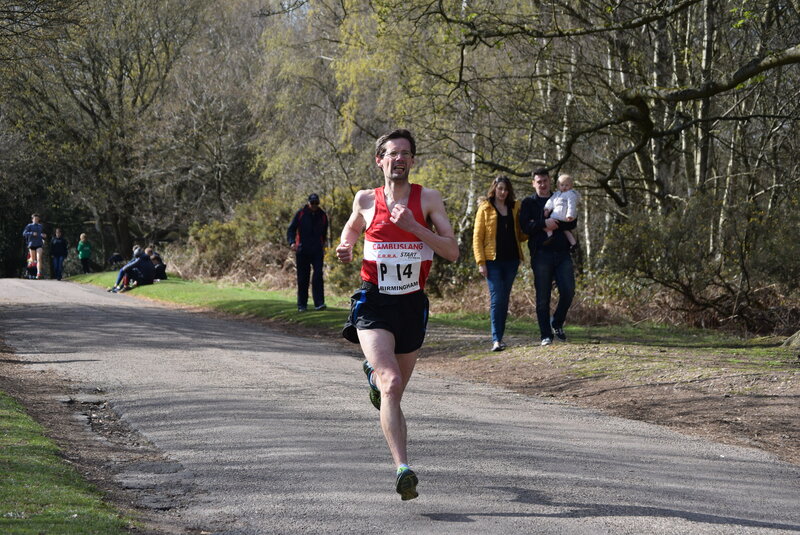 Jamie Mackinnon working his way back from an Achilles injury narrowly lost out by 5 seconds on the final team medal spot. From a field of over 300 senior women runners Moira Stewart emerged as a worthy runner up to the pre race favourite Steph Twell with Morag Miller getting the better of North East of England Cross Country Champion Mhairi MacLennan in the closing stages. 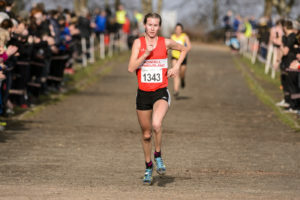 Moira is the current Czech Republic Cross Country Champion and will shortly be competing in the World Cross Country Championship in Denmark. 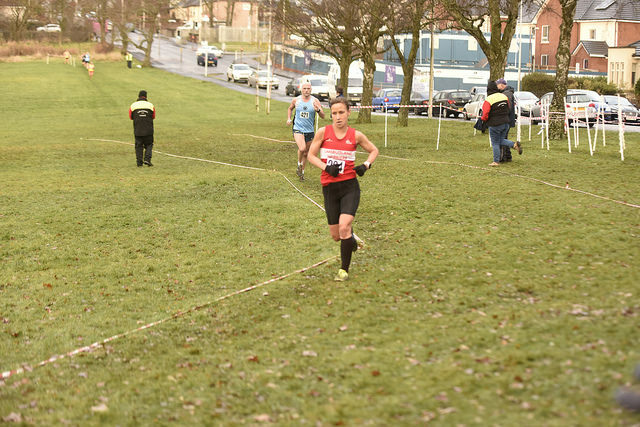 She is eligible to compete for Cambuslang as her father Eddie is a former Scottish Cross Country Internationalist and has won the Scottish Masters Cross Country Masters Gold Medal in the over 40, 45, 50, 55 and 60 age groups. Eddie actually met his wife to be in Italy when he was representing Scotland in an International Cross Country Event and Mia was representing the then Czechoslovakia. On marrying Mia Eddie moved to Prague but continues to run for Cambuslang when back in Scotland visiting family. Moira has previously won the Scottish U20 1500 Metres Championship and was a member of Cambuslang’s under 20 ladies cross country 2014 silver medallists. Moira is the first Cambuslang senior lady to have won a Scottish Senior Ladies Cross Country medal although Eve MacKinnon and Alex Lamond have previously lifted bronze medals at under 17 and 20 levels. This year for the first time 5 female finishers were required to complete a team. Kirsty O’Brien, Jennifer Reid, Carole Setchell and Lesley McArdle backed up Moira to finish 11th from 24 competing teams. 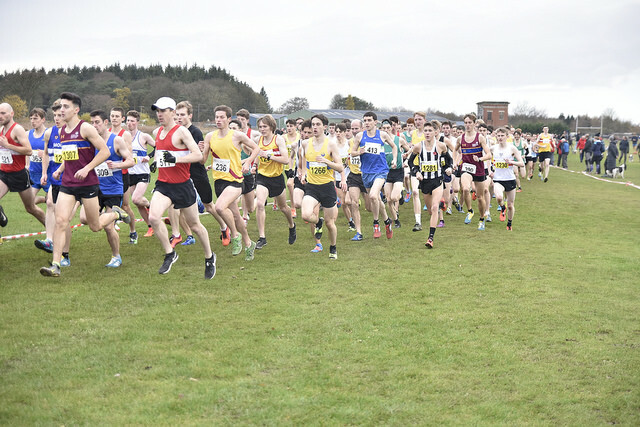 The final race of the day saw over 700 senior men line up with Cambuslang providing 27 of them. Prior to the event both Cambuslang and Central AC shared the record of 8 consecutive team victories. The question was could Central break the existing record or could Cambuslang, Inverclyde, Shettleston or Corstorphine stop them? In spite of a valiant effort from Cambuslang and Inverclyde the Central sextet was too strong and packed well to claim the record outright of 9 consecutive wins. All credit to Central AC and their coach Dereck Easton. The 6 runners helping Cambuslang to the team silver medals were Ryan Thomson, Stuart Gibson, Kevan Harvey, Iain MacCorquodale, Fraser Stewart and Alasdair Campbell who finished in positions 13 to 34 within the space of exactly one minute. The next 6 to finish would have gained 9th position from 42 finishing teams if B teams were allowed to score. The second sextet comprising of club captain Iain Reid, Ben Hukins, Doug Roberts, Ritchie Carr, Kyle McLellan and Kenny Campbell all finished between 43rd and 84th position. Justin Carter also made the top 100 in 94th spot with Craig Jardine not far away from a top 100 place. Cambuslang runners continued to cross the line in the following order Jamie Reid, Iain McDonald, Eddie Stewart, Brendan Carey, John Paul Murphy, Iain Nicholl, Mick O’Hagan, Alasdair Murray, Dan O’Connell, Scott Hunter, Des Dickson, Willie Fairley and John Kelly. Many thanks are due to all the Cambuslang coaches, officials, parents and supporters and to Brian Hughes and Colin Feechan who acted as the 2 club volunteer stewards. 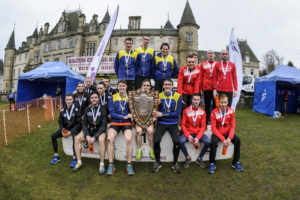 Finally the Scottish Athletics team and members of the organising club Falkirk Victoria deserve a special mention for their role in staging such a well run championship. 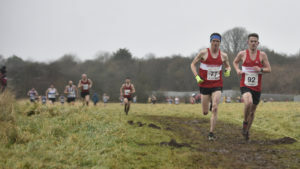 14 members of Cambuslang Harriers made the long but rewarding journey to compete in the Masters Cross Country Championships at Hawick as they returned with the over 40 and 50 men team titles along with 7 individual medals. The local club Teviotdale Harriers had set out a testing trail over rock hard undulating farmland and open country. The runners were blessed with bright sun shine albeit cold unlike the last occasion when arctic conditions prevailed. In the opening 6K race for the lady masters and men over 65 Cambuslang were represented by Jennifer Reid and Frank Hurley. 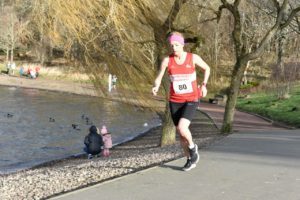 Jennifer ran a determined race throughout and finished a creditable11th in her age category. 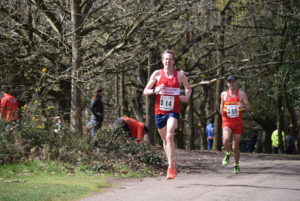 Frank who is still on the recovery road from illness nevertheless managed to take the M65 silver medal behind his local rival Andy McLinden of Hamilton Harriers. 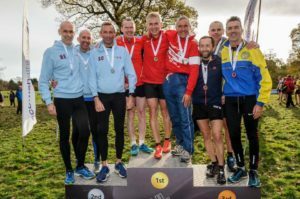 Next up were the male runners between the ages of 40 and 64 with 4 runners to count for the coveted over 40 team prizes and 3 for the over 50 team awards. Cambuslang who had narrowly lost their M40 title the previous year to Corstorphine were keen to regain the title. Pre race it looked to be a 3 race battle between these 2 clubs and a strengthened Shettleston master’s team. However, the Cambuslang quartet of Ben Hukins, Iain Reid, Kenny Campbell and Justin Carter packed well in 4th, 5th, 9th and 12th position to ensure a comfortable victory over Shettleston and Corstorphine. Both Ben and Justin were further rewarded with individual bronze medals in the over 40 and over 45 men categories. Offering good back up in this age group were 5th placed M45 Jamie Reid and Iain Nicholl. Cambuslang were the defending champions in the over 50 event but looked to be facing a strong challenge from Cumbernauld AC. 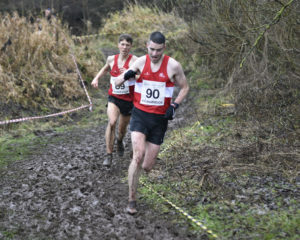 However, led by 59 year old hill runner Colin Donnelly who is at home in this type of terrain and with able support from Charlie Thomson and Stan McKenzie the Lanarkshire men prevailed over Cumbernauld by a margin of 17 points with Corstorphine third. 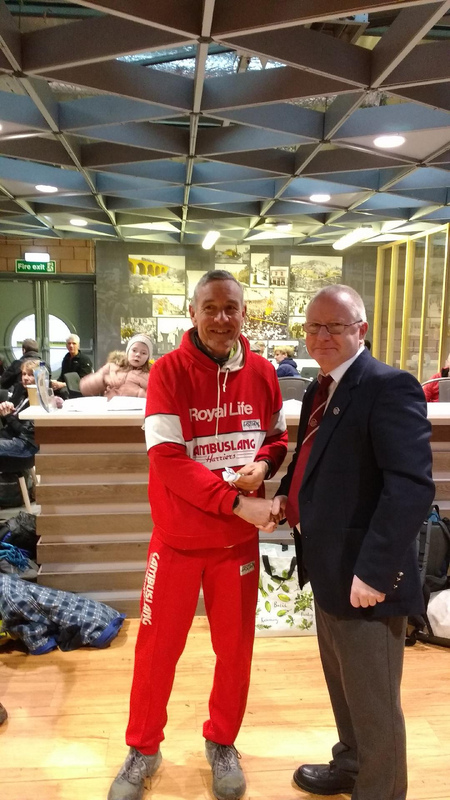 Both Colin and Charlie lifted the M55 and M50 individual gold medals while Stan took the M55 silver with club mate Chris Upson taking the M 55 bronze award. 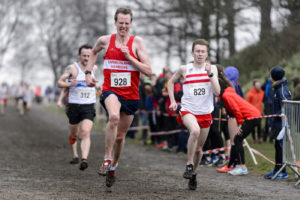 Mick O’Hagan and unlucky Des Dickson who had a spike problem mid race provided the vital back up support required in team events. 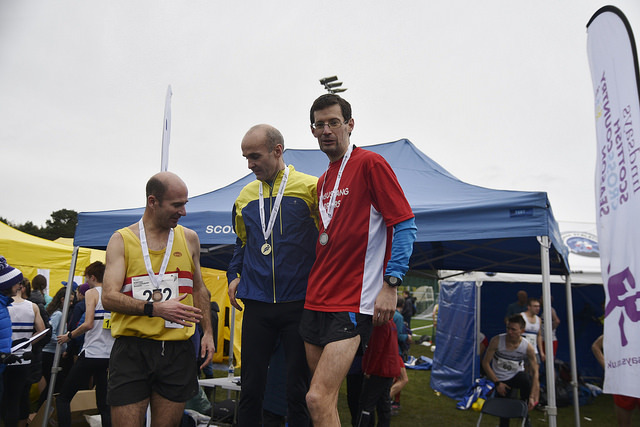 Not surprisingly Charlie was delighted to have won his first individual Scottish gold medal in 40 years of running. 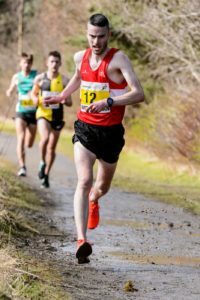 He can add this coveted award to his long list of Scottish team gold medals and to his Scottish 10 mile individual silver and to his UK individual silver and bronze medals at 5K and 10K. This achievement is all the more remarkable as in recent years he has been inactive running wise due to a series of injuries and to a bad fall which threatened to end his running career. Teviotdale Harriers and Alex Jackson and his team from Scottish Athletics are to be congratulated for staging a well run championship over a traditional country course. 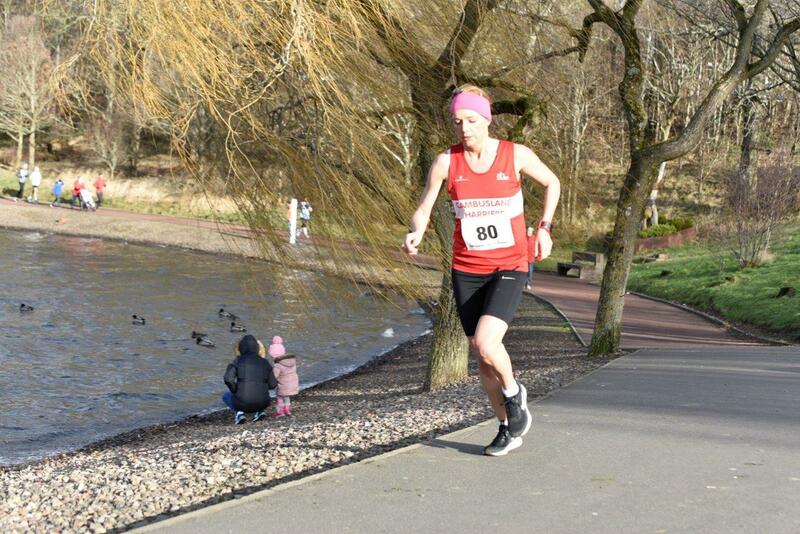 Nearer to home 4 Cambuslang Harriers took part in the Inverclyde 5 mile road race. Times were generally slower this year over this potentially fast course on account of the adverse wind conditions. 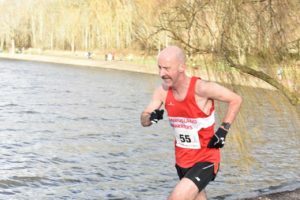 Stuart Gibson was the first Cambuslang runner home in third place in a time of 25.18 6 seconds ahead of under 20 clubmate Gavin Smith. Al Campbell was a good 7th recording 26.30 with M45 Scott Hunter stopping the watch at 32.02. This was a good workout for Stuart and Gavin before they head off next week to compete in the prestigious Armagh 5K International Road Race. They will be joined by fellow Cambuslang athletes Ryan Thomson, Fraser Stewart, Kevan Harvey, Jamie MacKinnon, Colin Reilly and Richard Carr. 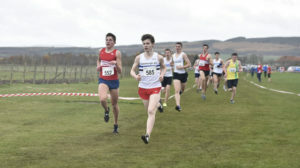 Christopher McLew escaped the cold and wind when competing in the Scottish under 20 Indoors 1500 M Championship at the Emirates Stadium. Having won his heat on the Saturday he was again first over the line in the final the following day to take the Scottish title. Eddie Stewart’s daughter Moira continued her run of good form when she won the Cross Della Vallagarina Rovereto event in Italy ahead of Italian and Hungarian runners. 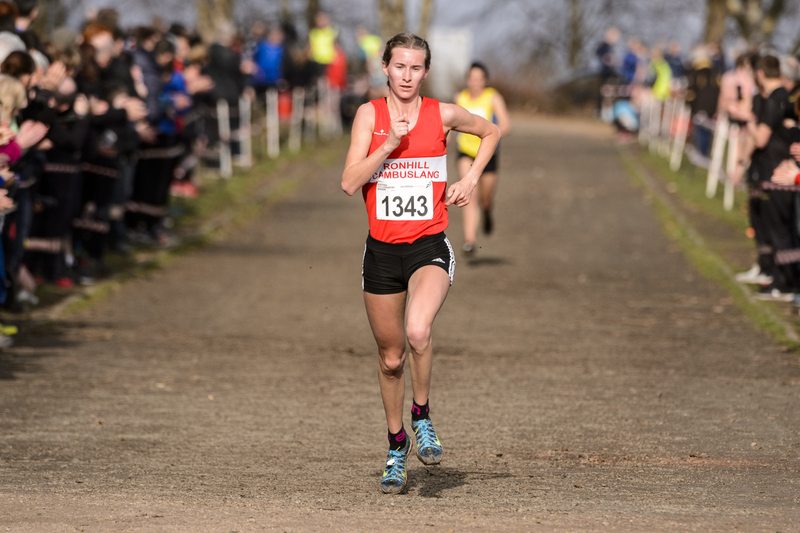 On the strength of this victory and on her 29th place in the recent senior ladies European Cross Country Championships she has been selected to run for the Czech Republic in the forthcoming World Cross Country Championships. 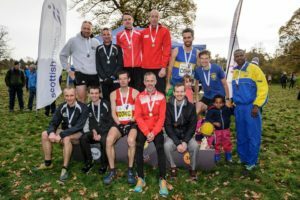 Cambuslang Harriers turned out in force at the annual Scottish Veteran Harriers LSK Road Relays around Strathclyde Park. Cambuslang fielded 3 over 35 male teams, 2 over 50 male teams, 1 complete ladies team with an incomplete team of 2 ladies. 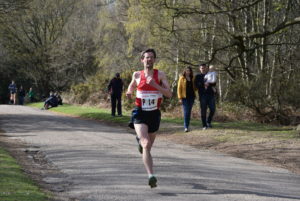 Both males and female races were held in conjunction around the 6K Loch circuit with 4 runners comprising a male team and 3 runners for the ladies. While the weather stayed dry the increasingly strong winds had a considerable wind chilling effect both on the temperature and on times. 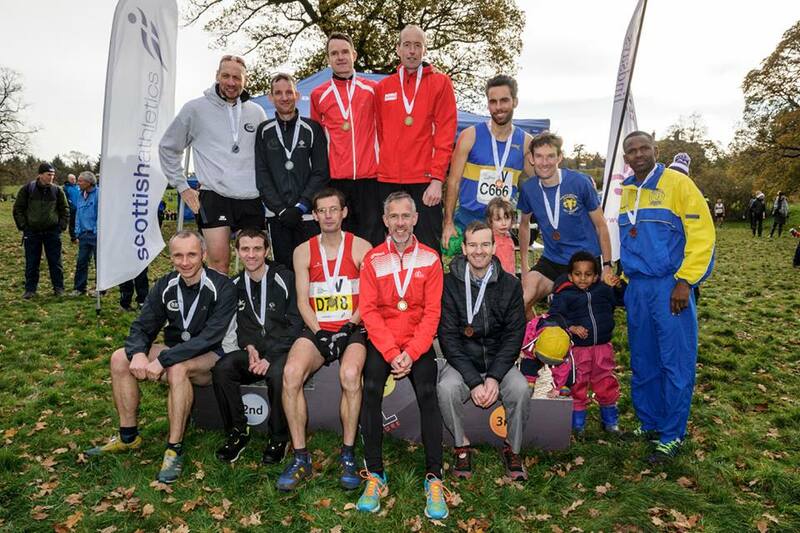 The M35 A team of Kenny Campbell, Gordon Robertson, Jamie Reid and Ben Hukins led the race from start to finish ahead of Edinburgh AC and Dundee Hawkhills Harriers. It was not surprising that the club had a winning margin of over 2 minutes since Kenny and Ben recorded the 2 fastest times of the day with Gordon being the 4th fastest. 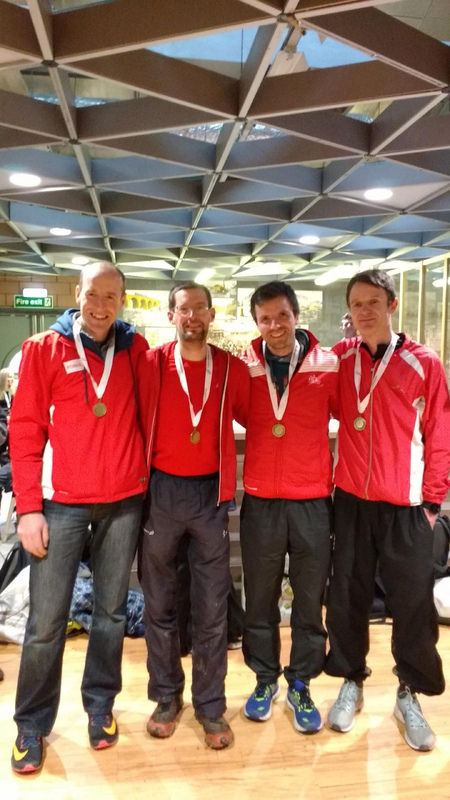 The M50 A team also gained a podium place finishing 2nd in their age category, sandwiched between Cumbernauld AC and PH Racing Club, thanks to Dave Thom, Charlie Thomson, Mick O’Hagan and Chris Upson. 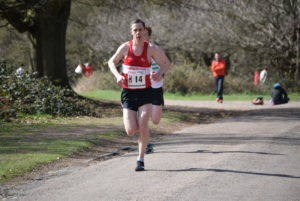 Charlie’s 3rd fastest individual time was further evidence of another step in his comeback after a long injury spell. Cambuslang’s M35 B team comprising of the non related McDonalds, Iain and Gordon, Iain Nicholl and Frank McGowan finished a very creditable 8th and were the first B team over the line. 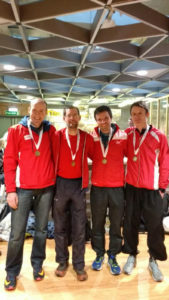 Colin Feechan, Dan O’Connell, Sandy Eaglesham and Alick Walkinshaw combined well to gain 5th spot for the over 50 B squad. 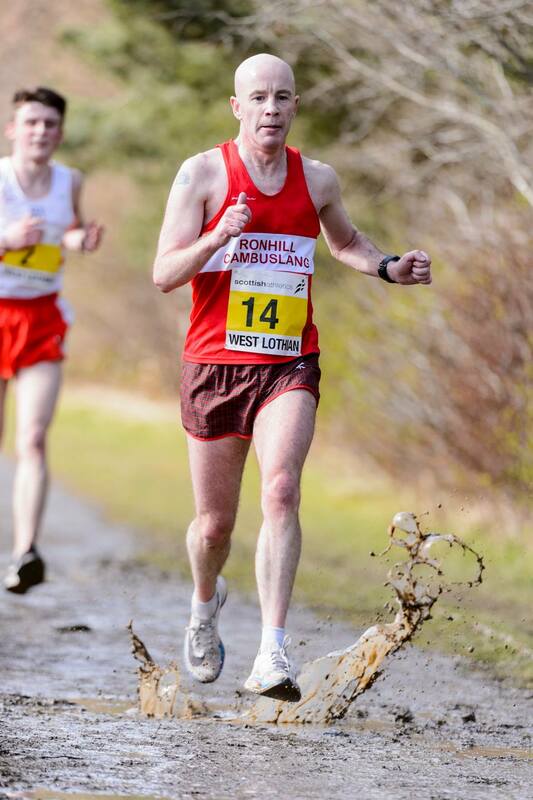 The final male team of Tony McCutcheon, Kenny Finlayson, John Kelly and David Stirling were 42nd in the team standings. Carole Setchell, Jennifer Reid and Kirsty O’Brien worked hard in the windy conditions to take a laudable 7th place with both Jennifer and Kirsty sharing the same individual time and the joint 14th fastest overall of the day. There were also encouraging runs from Bernie O’ Neil who finished a gutsy 6th on the opening leg and also from Julie Dell on leg 2. Members of Cambuslang Harriers also fared well in various parkruns the day before. There were victories for Kerry-Liam Wilson at Girvan, Doug Roberts at Strathclyde Park, Ritchie Carr at Falkirk and Alasdair Campbell at Linwood while Iain McDonald took 3rd place at Tollcross. Alasdair had a busy weekend having also won the 3K on the Green on the Friday. The senior and masters men teams again stuck team gold while the under 20 and 17 men took silver medals and the under 15 girls and boys bronze medals. There were individual silver medals for under 17 Christopher McClew, under 20 Gavin Smith and masters men Ben Hukins while Iain Reid captured the masters men bronze. The first event of the day was the under 13 girls with Abbie McClue leading home Eva Ritchie, Lucy McGrandle and Morvern Crawford into 5th spot in the team race. The under 13 boys trio of Sam McCarthy, Brodie McDonald and Hamish Gardiner finished in 8th position with back up coming from Gavin Kelly, Chris Black and Alex Petrie. Niamh Riggins, Shona Carey and Eilidh Kennedy secured team bronze for the under 15 girls while the under 15 boys matched this performance thanks to Robbie Woods, Lewis Roddis and Zak Povey with Feargus MacGregor next home for Cambuslang. 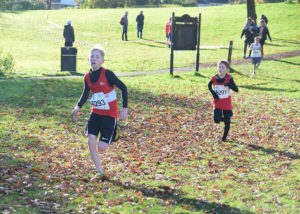 In finishing 7th and 8th Robbie and Lewis have secured automatic selection to the West District Team for the forthcoming Scottish Inter District Championships in the New Year. The under 17 and under 20 ladies ran together albeit the latter had extra distance to cover. Susie McLaughlin finished 11th in the younger age group with Amy Craig 9th in the under 20 race. Susie too should gain selection for the Inter District Competition. The same format applied to the under 17 and 20 men. The under 17 trio of Christopher McClew, Ruairidh MacGregor and Michael Black finished a good second and all confirmed their place for the Inter District Event. Kai Newall provided back up. 2nd placed under 20 Gavin Smith led Jamie MacKinnon and Drew Pollock to team silver with Andrew Carey in support. The combined senior and masters women event saw Cambuslang finish 8th team thanks to Kirsty O’Brien, Jennifer Reid, Bernie O’Neil and Lesley McArdle. 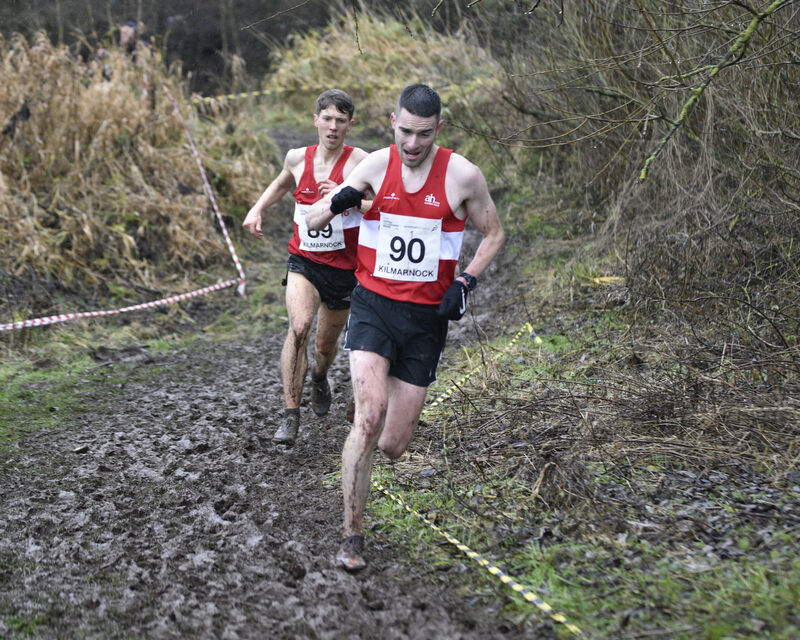 All four ran well in the driving rain and in the increasingly muddy conditions. The senior and masters men lined up for the final event of the day with the weather rapidly deteriorating. However, this did not deter the Cambuslang men. Right from the gun it was clear that it would be a close encounter between Cambuslang and Shettleston Harriers for the top team spot. This proved to be the case throughout. Although Shettleston had their 6 counters home in the first 17 positions compared to Cambuslang’s 6 in the top 18 Cambuslang prevailed by 9 points. 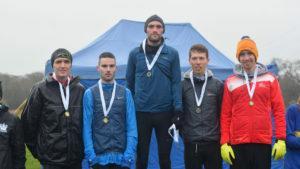 The club’s tight packing of Fraser Stewart 4th, Alasdair Campbell 5th, Kevan Harvey 6th, Ryan Thomson 8th, Stuart Gibson 16th and Ben Hukins 18th ensured the gold medals were going back to Cambuslang. Fraser, Alasdair, Kevan and Ryan have booked their places for the senior district team with under 20 Gavin also being a contender. 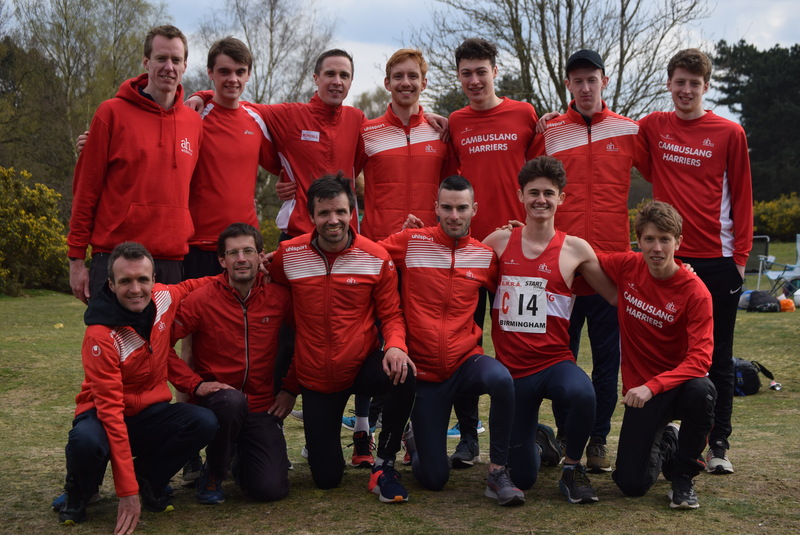 The harriers have an outstanding record in the senior competition having medalled on 41 occasions out of the last 44 years to win 25 gold, 12 silver and 4 bronze medals. From the 1975 team which won the club’s first senior district medal Robert Anderson and David Cooney are still heavily involved with the club. 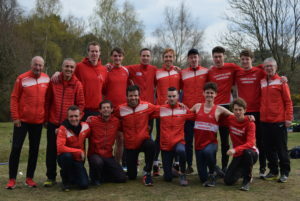 The masters’ team victory with Ben 2nd, Iain Reid 3rd and Justin Carter 7th was achieved more comfortably from Shettleston and Garscube Harriers. Craig Jardine and Iain Red in 19th and 21st position finished closely behind Ben. Thereafter, the Cambuslang runners crossed the line in the following order – Alistair Campbell, Justin, Ritchie Carr, Matthew McKenna, Iain Nicholl, Mick O’Hagan, Dave Thom, Des Dickson and Eddie Carr. Well done to all our competitors today given the challenging weather and conditions. 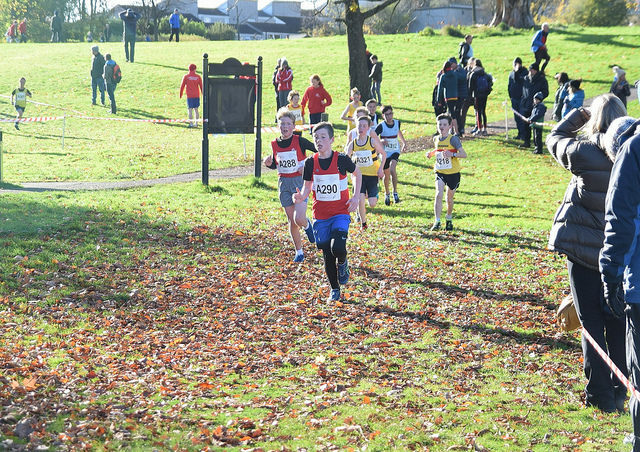 Thanks are also due to the club’s back up team of coaches, officials, supporters and parents and also to the West District Organising Committee and to Kilmarnock Harriers. Members of Cambuslang Harriers were in cross country action in the Czech Republic, Liverpool and Coatbridge. 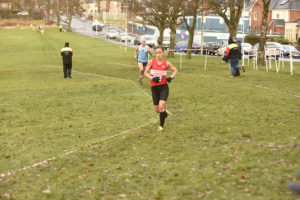 First year senior Moira Stewart, who has a Scottish qualification through her father Eddie, a former Scottish Internationalist and multi Scottish masters cross country champion, won the Czech senior ladies championship. Moira will now compete for the Czech Republic in the forthcoming European Cross Country Championships in Holland. Meanwhile at Liverpool Ryan Thomson representing Scotland as an under 23 runner acquitted himself well against the cream of British cross country athletes. 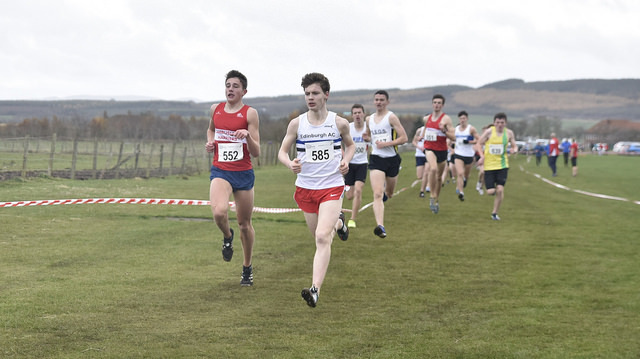 Under 20 Gavin Smith and Drew Pollock along with under 17 Christopher McLew gained useful experience in such a prestigious event as did under 15 runner Eilidh Kennedy. 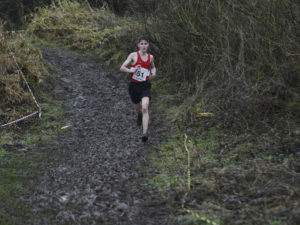 Much nearer home Cambuslang Harriers were competing in the Lanarkshire Cross Country Championships at Coatbridge. 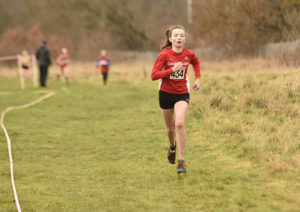 In the opening event for under 11 year olds Olivia McNichol led from the start and held off any challenges to come home first in the girls under 11 competition. 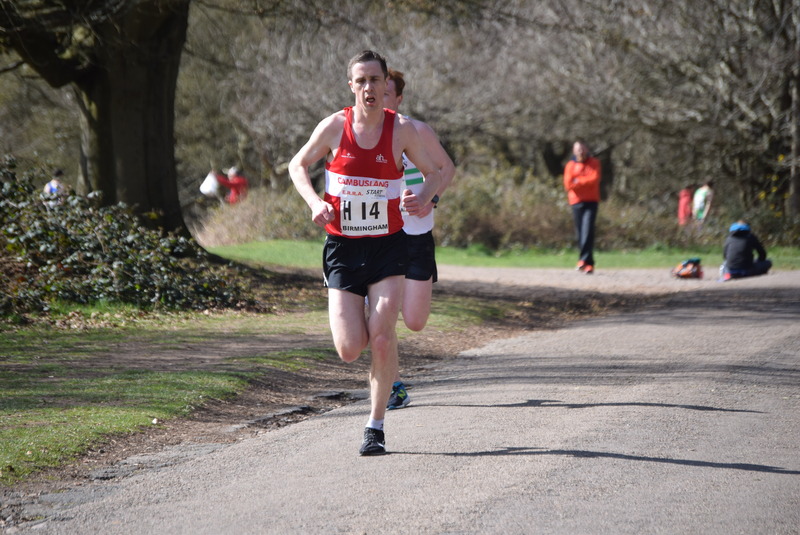 Her male counterpart, Neal McShane in 11th position, had a good solid run. In the under 13 girls event Abbie McClue took the runner up spot and with support from Eva Ritchie and Lucy McGrandle the club won team bronze. The under 13 boys team of individual bronze medallist Sam McCarthy, Brodie McDonald and Gavin Kelly went one better in lifting team silver. Unfortunately the under 15 girls, due to injuries and other commitments, were not able to field a team to support 5th place Peggy Nan Rodgers and 8th place Millie Nichol. The under 15 boys team of Robbie Woods, Lewis Roddis and Fearghus MacGregor packed well in 3rd, 4th and 7th position to gain team silver with Zac Povey just losing out to Fearghus in the sprint to the line. 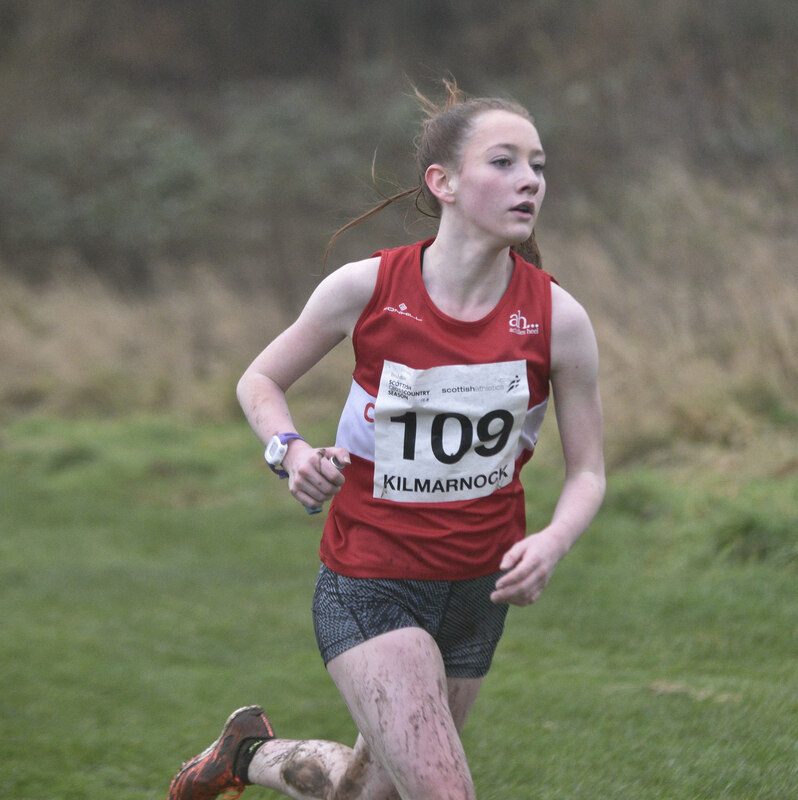 Susie McLaughlin pushed herself in the under 17 ladies race to finish in the bronze medal position and with back up from Holly Brock and Chloe Burton the ladies gained team silver. The under 17 men were on course for team victory when the leading Cambuslang runner Brodie Aitken was forced to drop out due to a calf strain. Aaron Grew ensured however that a Cambuslang runner would make the medal podium when finishing 2nd with Kai Newall 8th. The women and men ran together in the final race of the day and both were awarded team silver medals. 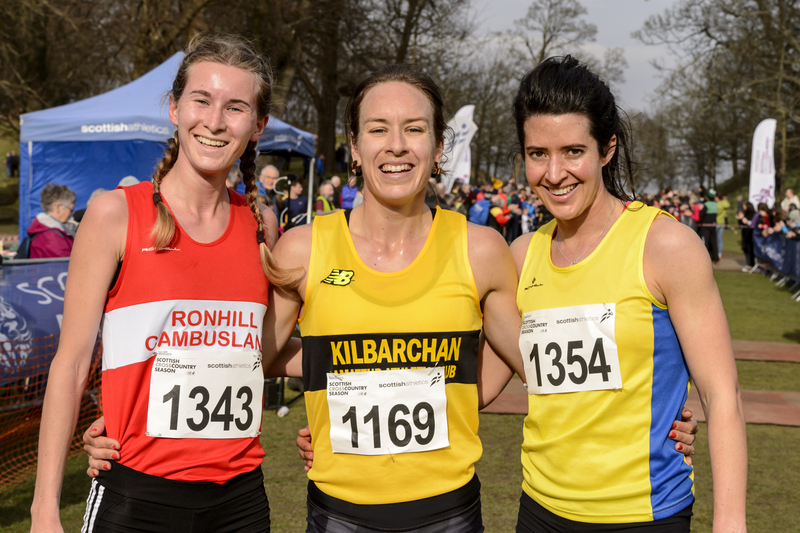 3rd placed female Kirsty O’Brien, Bernadette O’Neil and Lesley McCardle were the 3 counters while Kevan Harvey, under gold medallist Jamie MacKinnon and Ritchie Carr made up the men’s trio. There were 2 further individual silver medals for under 20 lady Amy Craig and M40 Justin Carter. 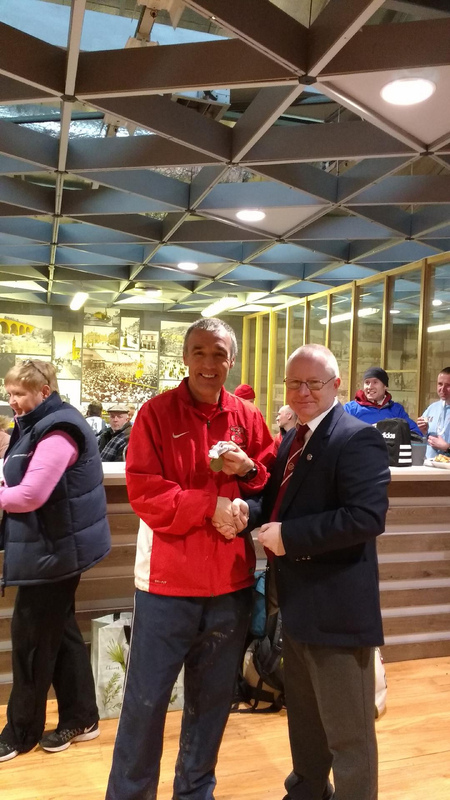 Elsewhere M40 Paul Kernohan won the Tollcross Parkrun. Thanks as usual are due to our coaches, club volunteers and supporting parents for their invaluable contribution on the day. 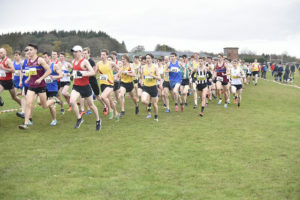 The Scottish Short Course Cross Country Championships were held this year on a flat and fast course at Lanark with Tinto Hill providing a scenic backdrop. 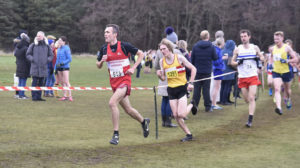 Although the competition was fierce with athletes from all over Scotland taking part Cambuslang Harriers featured among the medals with the under 17 men and M40 master Ben Hukins, M50 master Charlie Thomson and M60 master Paul Thompson all gaining a podium place. The under 15 girls kicked off the race programme in their 2K event. Shona Carey in her best cross country run to date finished an excellent 8th and with good back up from Niamh Riggins, Peggy-Nan Rodger and Eilidh Kennedy clinched 4th team spot. 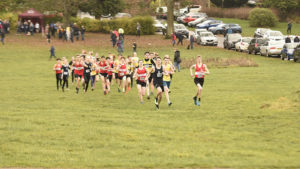 The 2K under 15 boys event saw Robbie Woods run the race of his life to come home 5th just missing out on an individual medal by a few seconds. Next home for the club was 10th placed Lewis Roddis who also turned in a magnificent performance in his first year in this age group. The 3rd counter, Feargus MacGregor, ensured 5th place for the club in the team competition. Alex Barnett finished close behind with Ross Noble also participating. Attention now focussed on the under 17 women and men who were racing over 3K. 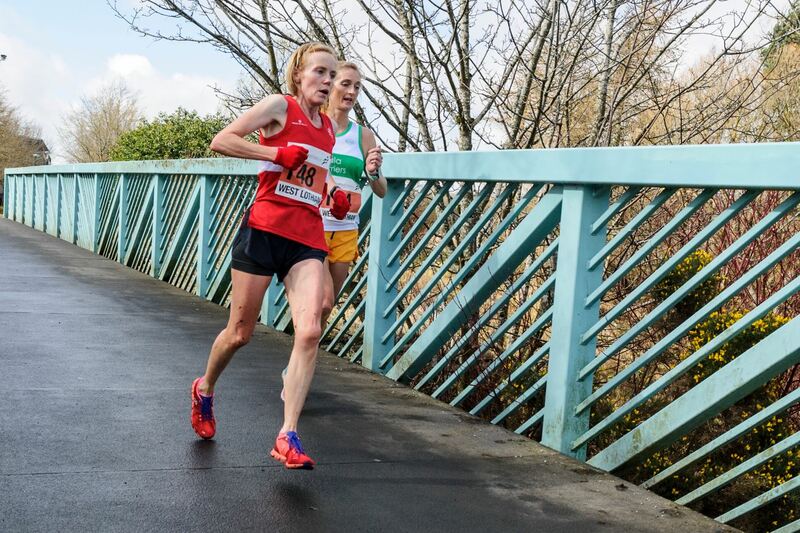 Susie McLaughlin showed determination to finish 16th in her first year in this age category while Holly Brooks in a welcome return to racing paced herself well and will benefit from the work out. 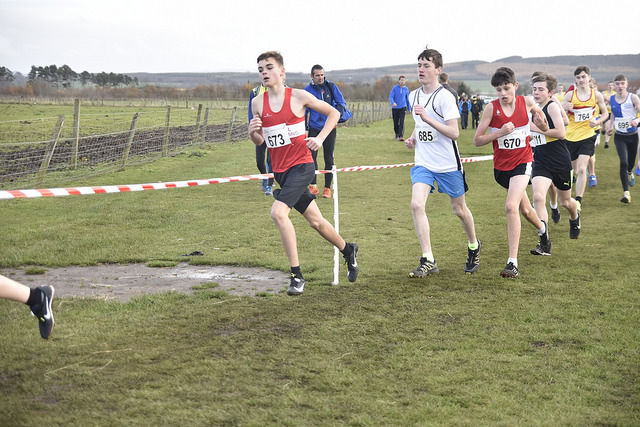 The Cambuslang under 15 male squad fielded 7 members and in a competitive and exciting race Ruairidh MacGregor in 9th position led the fast finishing Christopher McLew and Brodie Aitken to the bronze medals. Michael Black, Kai Newell, Aaron Grew and Jack MacKinnon all finished in close proximity to one another. The distance now stepped up to 4K for the under 20, senior and masters women. 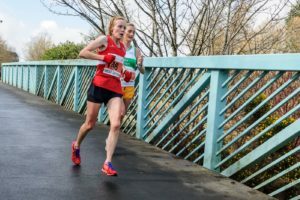 Master runner Jennifer Reid and under 20 Amy Craig were initially together before Jennifer’s endurance and experience saw her pull away from her younger rival. Both athletes placed well in their respective age groups. The same male age groups took part in the last race of the day which saw almost 500 competitors on the starting line with the club supplying 22 of them. From the off the pace was fast and furious and continued to be so. 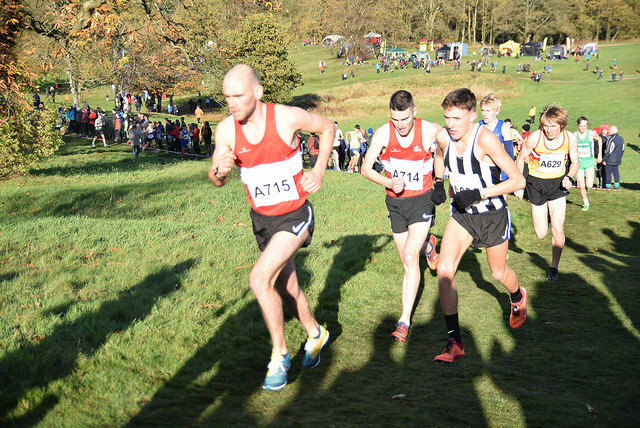 Ryan Thomson was the first runner home from the club in a worthy 13th place and with Fraser Stewart 22nd, under 20 Gavin Smith 28th and Stuart Gibson 37th Cambuslang finished 5th team. 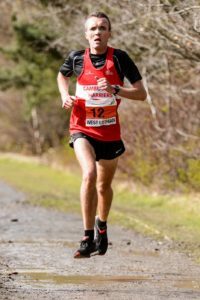 A succession of red and whites made the top 100 in the following order – under 20 Jamie MacKinnon, silver medallist M40 Ben Hukins, under 20 Drew Pollock, Al Campbell, Ritchie Carr, M40 Kenny Campbell and fellow M40 Jamie Reid. M40 Justin Carter and M50 silver medallist Charlie Thomson were just outside the top 100. 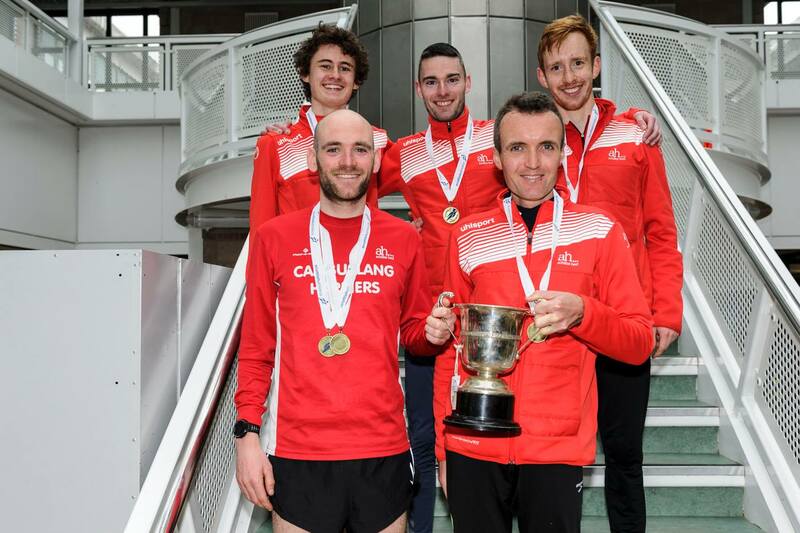 Cambuslang athletes continued to cross the line in tandem in the following order of M50 Alick Walkinshaw, M40s John Paul Murphy and Iain Nicholl, M50 Dave Thom , M60 silver medallist Paul Thompson, M50s Des Dickson and Dan O’Connell, Alasdair Murray and M60 Brian Hughes. Once again our coaches, members and parents offered their support to our athletes whose endeavours were as usual well captured on camera by Colin Stephen. With Colin about there is no hiding place for our athletes! A final vote of thanks is due to Scottish Athletics in conjunction with Law and District Athletics club for staging the event so well. All roads led to a sunny but cold Cumbernauld on Saturday where the Scottish Cross Country Relay Championships were fiercely contested across the age groups. There were awards up for grabs for male and female young athletes, men and women under 20/seniors and male and female masters over 40 and also over 50. Cambuslang Harriers acquitted themselves well with the Masters M40 and M50 winning gold medals in their respective age groups, the under 20/senior men finishing a laudable 4th and also supplying the second fastest B team, the ladies being 31st, the young females 20th and the young males 11th. 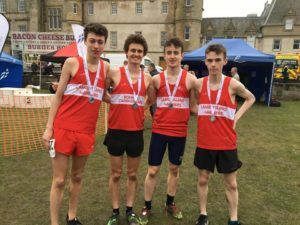 All in all 57 Cambuslang Harriers, including Drew Pollock who made his debut for Glasgow University, participated in this prestigious event. The first race off was the young females relay consisting of an under 13, under 15 and under 17 athlete. Abbie McClue, Niamh Riggins and Shona Carey combined well in 20th spot as did the B team of Eva Ritchie, Peggy-Nan Rodgers and Susie McLaughlin to achieve 31st position out of 82 finshing teams. Mya Carmichael and Eilidh Kennedy were in an incomplete team. The young male A and B teams finished a respectable 11th and 15th out of a field of 104 teams. Sam McCarthy of the A team handed over to Robbie Woods and Chris McLew with the latter two recording the 10th and 5th fastest times of the day in their age groups. Brodie McDonald also set up Lewis Roddis and Ruairidh MacGregor to advance the B team’s position. Likewise Hamish Garner gave Ferghus MacGregor and Brodie Aitken the opportunity to advance through the field. The harriers also completed two more teams thanks to Reece Duncan, Alex Barnett and Jack MacKinnon and to Matthew McColl, Ben McDougall and Aaron Grew. Both Chris Black and Dylan Stefani also ran the opening under 13 leg. All our young male and female athletes particularly the inexperienced 13 year olds deserve credit for competing on such a testing and undulating course. They will benefit from the experience. 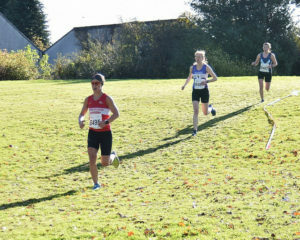 Under 20 Amy Craig in her first year of the sport led off for the ladies with Scottish, UK and European duathlete/triathlete medallist Kirsty O’Brien, Jennifer Reid and club coach Lynn Angley following on. The ladies stuck well to their task crossing the line in 31st place. Honours in that race went to Edinburgh University, VP- Glasgow, with whom we share the same kit sponsor achilles heel, and Kilbarchan. The final race of the day featured the men and as previously in the West Relays the A and B teams went head to head on the first of the 4 legs. 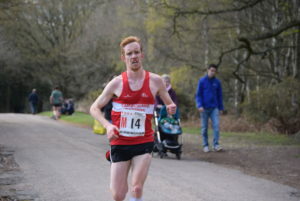 Keven Harvey of the A squad was a stride ahead of Fraser Stewart for a good part of the 4K circuit but in the closing stages Fraser edged ahead to come home in 8th spot with Kevan one place and 2 seconds behind. 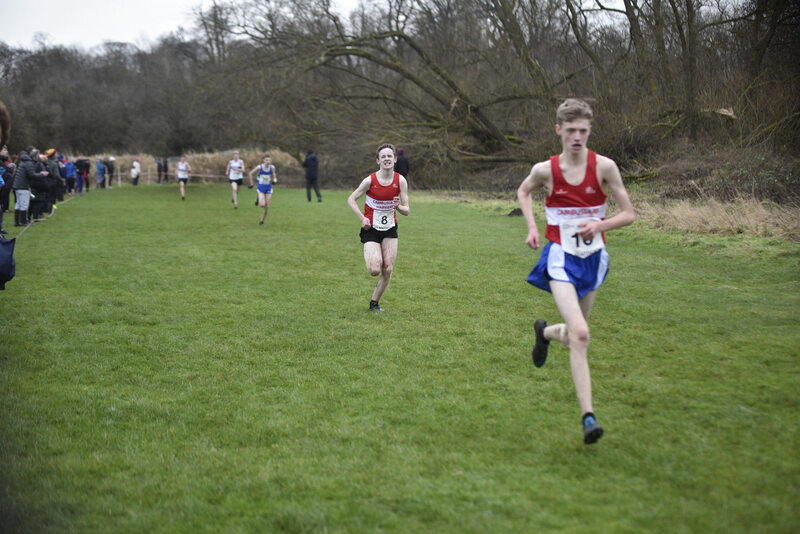 Interestingly Cambuslang’s first year under 20 Drew Pollock in the colours of Glasgow University’s B team came through strongly to clinch 11th position. 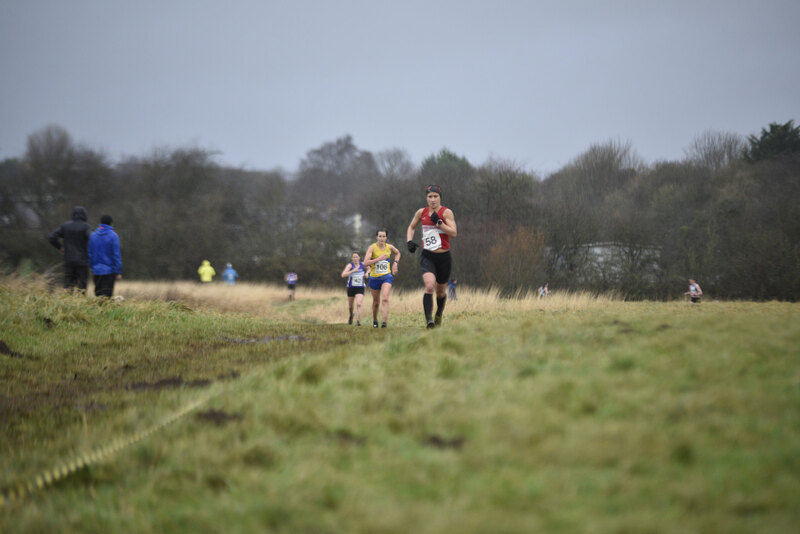 Lap 2 saw A team runner Ryan Thomson move smoothly through the field to take the club into the silver medal position while B team runner Craig Jardine kept Cambuslang at the top end of the field in 12th place. U20 Jamie MacGregor running mainly in a vacuum ran well to keep the club in medal contention in 3rd spot as former club captain Iain MacCorquodale in 13th position ensured the B team was ahead of most of the A teams. 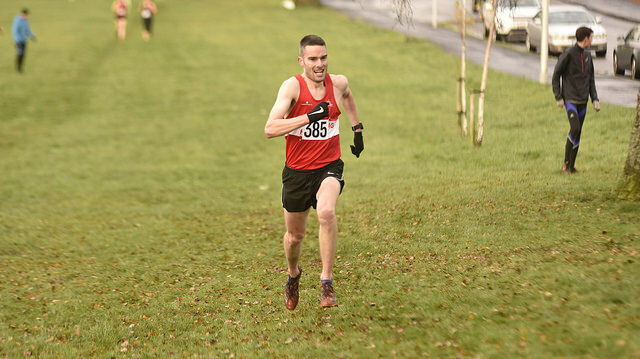 Fellow U20 Gavin Smith in spite of running a valiant race to hold a podium finish had to give way to U20 GB internationalist Sol Sweeney of Glasgow University who recorded the fastest time of the day. In the end the young Cambuslang A team had to settle for a worthy 4th place behind Central Ac, Kilbarchan and Glasgow University. Al Campbell moved the club up to 11th and sealed the 2nd B team spot in the race thus indicating the strength in depth of the club. 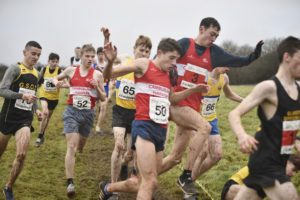 Unfortunately the C team of U20 Anfrew Carey, Ritchie Carr and Gordon Robertson lacked a 4th leg runner on the day while they were lying in 30th position out of 122 teams. The D quartet of James Smith, Dan O’Connell, Mick O’Hagan and Eddie Carr were 81st. The masters men competition for over 40s and 50s was incorporated into the men’s relay with 3 to count for the older masters and 4 for their younger counterparts. A fierce battle took place for the medals in both age groups with Cambuslang coming to the fore in the closing stages in both races. Chris Upson and Stan MacKenzie kept the M50s in close contention in 4th position before hill running specialist Colin Donnelly recorded the fastest time in the age group to seal an 11 seconds victory from a strong Cumbernauld trio with Shettleston taking the bronze medals. 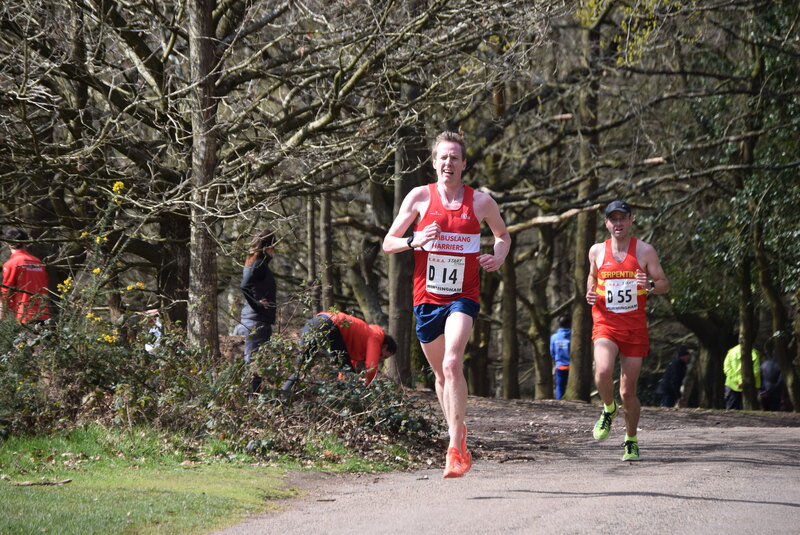 In the M40 category Justin Carter and Kenny Campbell making his comeback after a lengthy injury took the club into silver medal position before Jamie Reid overtook last year’s champions Corstorphine in the latter stages of leg 3. Ben Hukins extended the lead to 28 seconds over Corstorphine with Shettleston gaining the bronze medals. The B team of Alick Walkinshaw, Iain Nicholl, Dave Thom and Gordon McDonald finished a worthy 11th in addition to being the first masters B team. Both M50 and M40 teams have an impressive race history in this event. In the 7 year history of the older age group Cambuslang has won gold on 5 occasions and silver once. 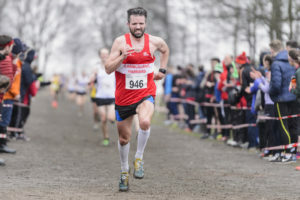 The M50s missed out last year having concentrated on the UK Masters Cross Country Relays held on the same day at Long Eaton in England where they secured the silver medals. The M40 event has a longer history having been in existence for 23 years. During that time Cambuslang has won 14 gold medals, 3 silver and 2 bronze. While the runners get the publicity and attention the invaluable background support from our club coaches, officials, parents and volunteers is greatly appreciated. Likewise, Scottish Athletics, North Lanarkshire Council and the local clubs deserve our thanks too.